Work in the house is coming along nicely and all being well I should be able to get back to my sewing next week some time. In the mean time, I thought you might be interested in some of the inspiration behind Fiona's design for the banner. The description of the lost medieval banner just called for a red cross on a white background, with no further mention of how plain or ornate that might have been. While this would seem to leave us with quite a free hand, it was unanimously agreed that the central cross design should be based closely on the pectoral cross of St Cuthbert. This beautiful cross, designed to be worn on a chain around the neck, was found buried with St Cuthbert when his coffin was opened in 1827, and is now on display in the Durham Cathedral Treasury. W. 6 cm. Garnets set in individual gold cells on a gold cross-shaped base plate. The central garnet is mounted on a white shell of Mediterranean origin. English. The arms are decorated with beaded wire, dog-toothing and dummy rivet heads. The suspension loop is secondary. Repairs show that the cross was not new when buried in the grave of St Cuthbert in 687. A number of decorative elements and the general concept of a cloisonné cross show an awareness of Kentish jewellery of the 7th century, but the shape of the cross and the use of dummy rivets may place the piece in a Northumbrian environment. So, it was buried with St Cuthbert at his death in 687, and so may well have belonged to him in life. In its use of gold and garnet, it has some stylistic resemblance to other Saxon decorative pieces, such as many of the items excavated from the ship burial at Sutton Hoo, or in the staggering Staffordshire Hoard, discovered earlier this year. 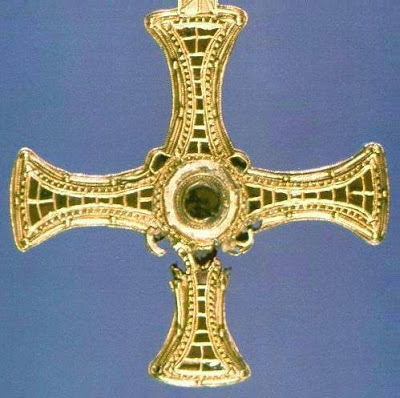 In one of the news reports on the Staffordshire treasure I caught a glimpse of what looked like another gold pectoral cross - it looked plainer than this one, though similar in some respects, but I haven't yet been able to find a photo of it to check. Since its rediscovery in 1827 the cross has become an unofficial emblem of Durham generally, so that it would have seemed odd if we didn't use it on the banner. As the description of the banner made it clear that it needed to be predominantly red, there's a lot less gold that would be called for in a closer representation, but we've still tried to keep it pretty close, with goldwork round the edges and in the central disc, and with the satin appliqué representing the garnets. The "dummy rivets" the description above mentions I've done with sequins! So it's not an exact copy, but I hope you agree that it is at least recognisable as St Cuthbert's cross. The image of St Cuthbert's pectoral cross is the property of the Dean and Chapter of Durham Cathedral. Very Nice!! I like the way the applique echoes the layout on the original cross! It's beautiful! That's all the appliqué done!